Awhile ago, actually 90 days ago I set forth to knit a sweater in 30 days. 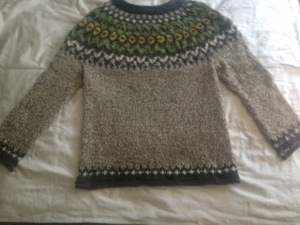 I have been wanting to knit an Icelandic style sweater called a lopapeysa, for some time and was in a rut. I came across a TEDtalk by Matt Cutts. Knitting a sweater in the round, with such detail of patterns always scared me a bit. 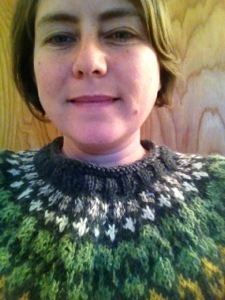 I found some confidence in the message from Matt Cutts and decided to give the lopi sweater a try. It was a good project to try. I used a pattern by Védís Jónsdóttir on Ravelry. I chose neutral colors since I wasn’t actually sure who I would be making the sweater for. I used Lion Brand fishermans yarn in oatmeal for the body, and found the rest of the yarn in my stash. I blocked the sweater today. I find that by dampening the sweater and blocking it flat is the easiest way to block. I read an article once that blocking makes a handmade item into a professional looking item. It relaxes the stitches and helps it hold its shape overtime. I highly recommend taking the extra few days to finish your knitted goodies by blocking them. Something magical happened when I pulled the sweater over my head, it became mine! All the while, keeping track of every stitch, making sure I’m following the color ways just as the pattern read, I was creating a new sweater that I’ll treasure for a long time. I challenge you to mix life up a bit and try a new skill, it’s an awesome feeling when you realize that you can just do it…you just got to take the first step…or stitch. This entry was posted in Knitting, Personal dialogue for a happy life and tagged Icelandic, Knitting, lopapeysa, riddari sweater, wool on May 12, 2013 by amybailey aka knitsakes. Very nice for a first try! I totally agree, I often try to push my limits a bit further with new knitting projects.